While it is essential to protect Windows PCs with antivirus software, one of the drawbacks of doing so is that it can slow down the PC. While that depends largely on the type of software installed and the performance of the PC, it is fair to say that security programs often cause a system to run slower than before. Slow downs can for instance be experienced on startup but also during scans. And it is here that you can mitigate some of these slowdowns considering that it is often not necessary to scan all folders on the system. If you add exceptions to the scan, you speed up the process which in turn means less of a performance impact on the system as a whole. A general recommendation is to exclude folders with non-executable files from the scan. It is not necessary to scan images or video files for example, and the same is true for plain text documents and other files that are not executable on their own. Lets take a look at Microsoft Security Essentials and how you whitelist folders in the application to block them from being scanned by the application. Select 1) if you want to whitelist certain files or entire folders on the system. To do so click on browse, select a folder and then Add. You can type paths of files and folders directly as well which is handy if you have a list already in text form as you can use copy and paste to add all locations at once. The second option excludes certain file types form scans. You can add them manually this time and need to separate individual items with a semicolon. This can be useful to block file types such as jpg or avi from being scanned by Microsoft Security Essentials regardless of location on the system. The third and final option enables you you to block processes and the files that these processes reads or writes from the scan. This can be handy if you have additional security software installed to avoid incompatibilities or issues. Once you have made your selection on the page, switch to advanced. Here you can also modify several scan related options. 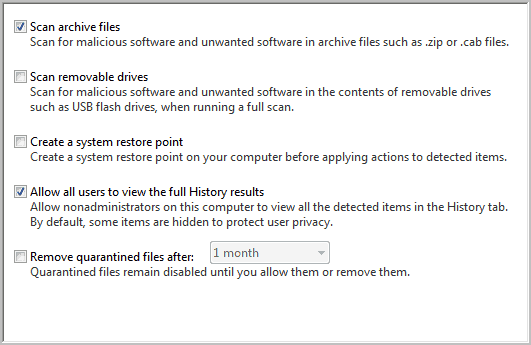 The scanning of archive files is enabled by default which you can disable here. Another useful option that you may want to enable on this page is the creation of a system restore point prior to removing, running or quarantining items. Most security programs offer similar configuration options that enable you to whitelist certain locations or file types. 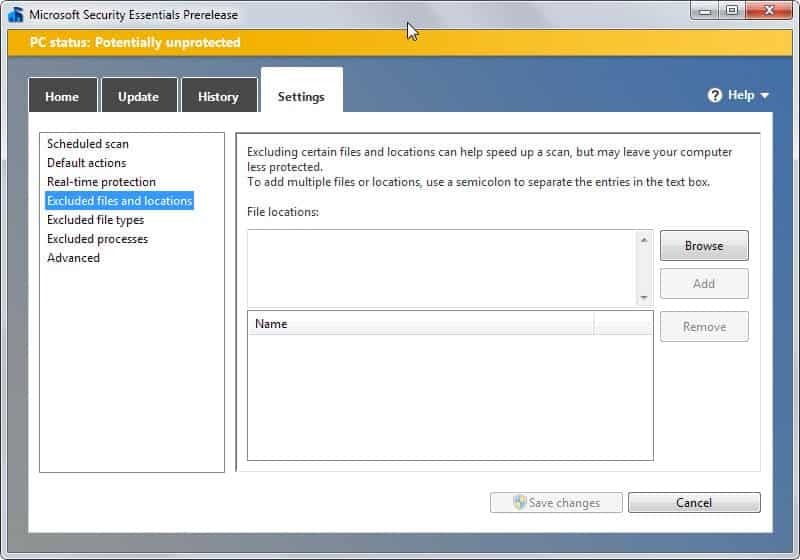 The article discusses why it may be useful to exclude certain files or locations from antivirus software scans.